Follow with us to discover the mobile blackjack collection of the recently overhauled Bet365 Mobile! How to find all the mobile blackjack titles? Bet365 has recently revamped their mobile interface to provide improved ‘on-the-go’ casino experience. This is good news for many casino enthusiasts. It’s time for online casinos to realize the importance of mobile-sites since more and more players choose touchscreens as their main device. Bet365 is trusted by millions of players, so this update holds even more importance. At first sight, I was a bit disappointed with Bet365 Mobile Casino’s blackjack selection. However, after getting used to the interface it turned out that the mobile blackjack arsenal is pretty decent. Here’s a guide, which will hopefully help you to reveal the full mobile blackjack potential of Bet365 Mobile. The Bet365 Mobile site greets its visitors with a loading page that lasts only a few seconds, depending on the specs of your device. You’ll land on the home-page that is dedicated to sportsbetting, as this was the main profile of Bet365. By tapping on the Bet365 logo, you’ll see a drop-down menu offering Sports, In-Play, Financials, Casino, Poker, Games, Vegas and Bingo. For blackjack players Casino, Games and Vegas are the go-to options. Blackjack games are distributed between these categories, which makes it a bit harder to discover the whole collection. 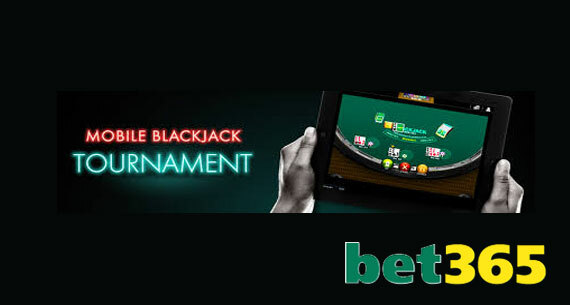 Bet365 Mobile Casino features only two mobile blackjack titles under the ‘Table & Card’ button. One of them is classic Blackjack, the other is Blackjack Switch. You’ll see that the games are not available anymore in free mobile blackjack version and this applies to all games. In order to play, you’re required to create a Bet365 Mobile account, which takes only a few simple steps and data. Bet365 Mobile Games also offers Table Games but here’ll you have more choices of blackjack: Blackjack, Beat the Croupier, Hi-Lo Blackjack and Grand Blackjack. Finally, Bet365 Mobile Vegas was also equipped with two options, namely Blackjack and Blackjack Classic. That totals to eight blackjack games but without switching the categories I would’ve found only two. Don’t get me wrong, Bet365 Mobile is still easy to use and their updates were for the best. Now, the in-browser experience is even more enjoyable, and for those who’d rather avoid the Apps’ storage consumptions this must be relieving. Bet365 Mobile instant-play and Apps both have their pros and cons. After all, the choice is totally up to your preferences: download or no-download?